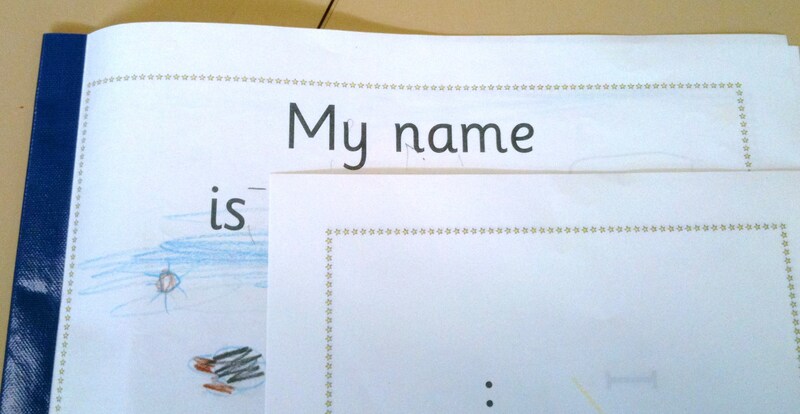 ← Day 6- First year of formal education in Victoria, Australia for my 2011 Prep students: 4 & 5 year olds. PrepD Student Led Interactive Writing – Collective knowledge combined with collaboration is powerful! 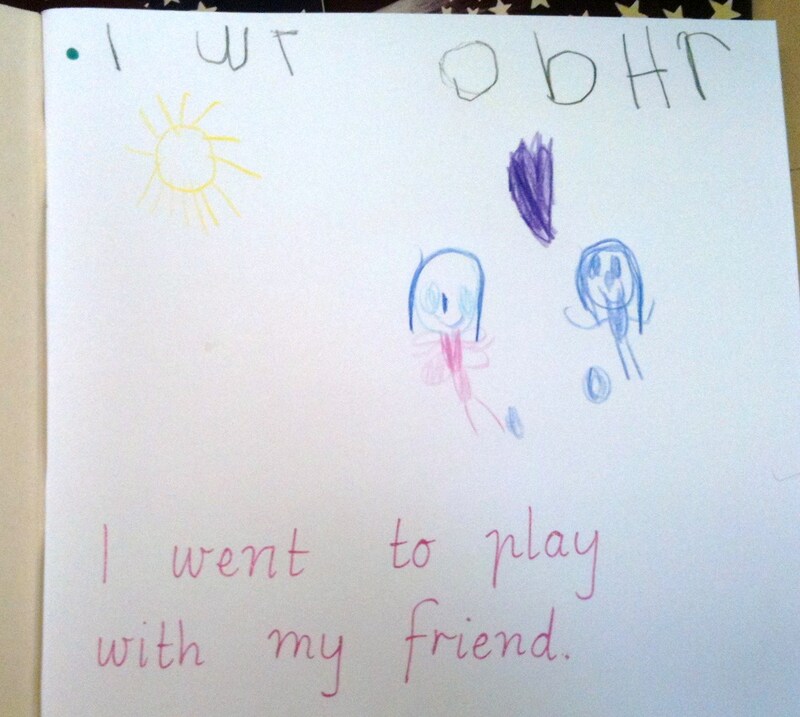 Young children starting their first year of school (Prep in Victoria, Australia) have big expectations about school, and I don’t want to disappoint them. They want to learn, they want to be able to read, write, and know things about numbers. They want to explore the playground, make a new friend, and feel comfortable in their new environment … and paint a picture. The philosophy behind the ‘Language Experience Approach’ underpins my teaching at this stage of the year. What I think about, I can talk about. I can read what I can write, and what other people can write for me to read. The Language Experience Approach is powerful because it contributes to developing a strong oral vocabulary. It is well researched that children with good oral language find the path to literacy easier. All students draw upon their vocabulary when reading and writing no matter what level of schooling they are. 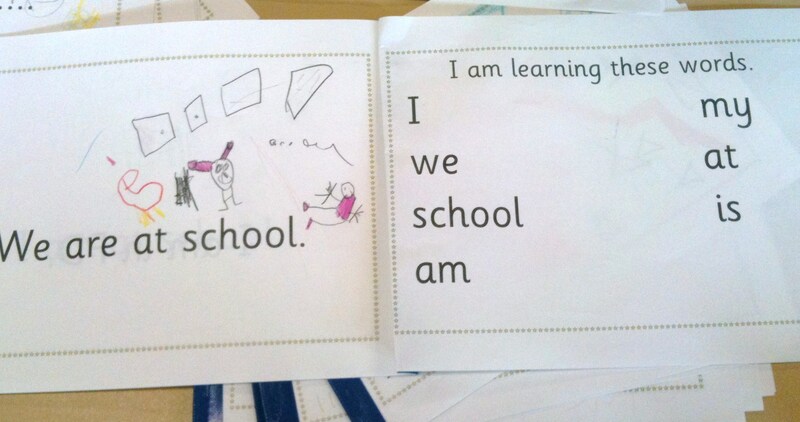 This week my preps are illustrating and reading their first Language Experience book. This will be taken home, and read as part of my home reading program. The message I give parents is, it’s not glossy, it’s theirs, and it’s an important book. The book is created from sentences we are developing about a common experience, and starting school is the most obvious content choice for our first book. I started exploring Language Experience three years ago, and how I implement this has changed. It’s now about ‘less waff’. Is ‘waff’ a word? 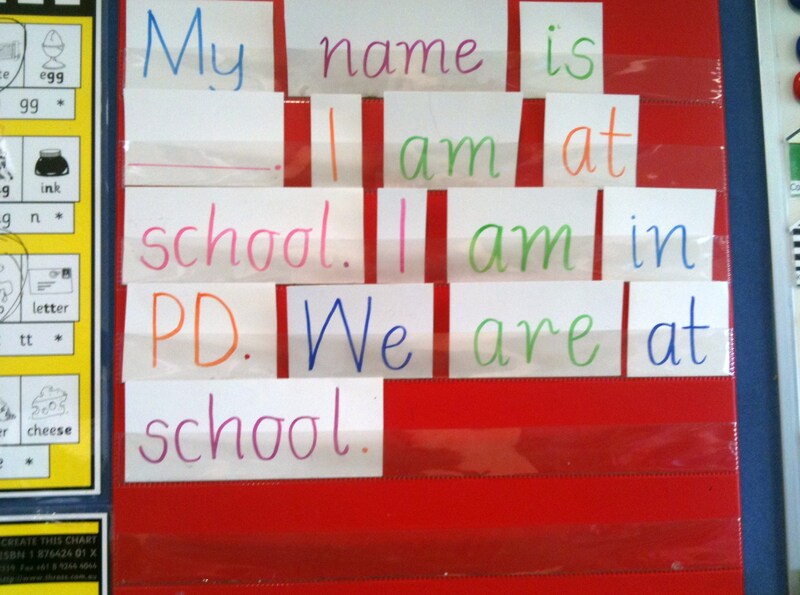 As sentences are created they are written on sentence strips and placed in a sentence strip board. Once four sentences are created, a little book is made. Once the book is made, the sentences are removed from the board and glued to a large sheet of paper, prominently displayed, and read everyday. This strategy works! 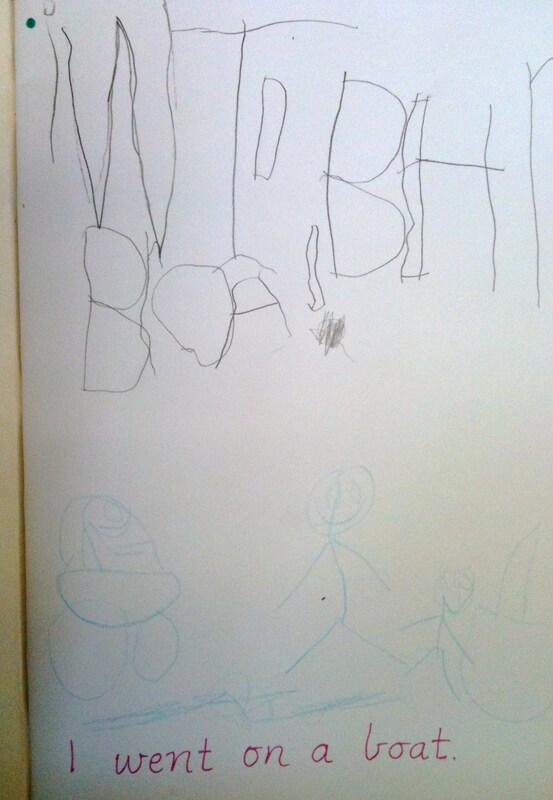 Today the children wrote their first journal. They have learnt about using a writing spacer to use between words. Introducing the writing spacer this early in the year is new for me. They are also using a spacer between each word, instead of using one counter and moving it each time. I think this is a better strategy for this time of the year. Each child also has access to an alphabet sound card, and it was great to see these being used. It’s still early in the year, but have a look at their independent writing – sensational! What a fantastic start these young writers have made. The last sample reads: I went to my nanas. I hope you enjoy seeing my student’s progress recorded this year. This is their 8th day of formal education! Almost all of last week was spent working with primary teachers who are eager to help new writers begin. This post (and the student writing samples you share) is eye-opening. 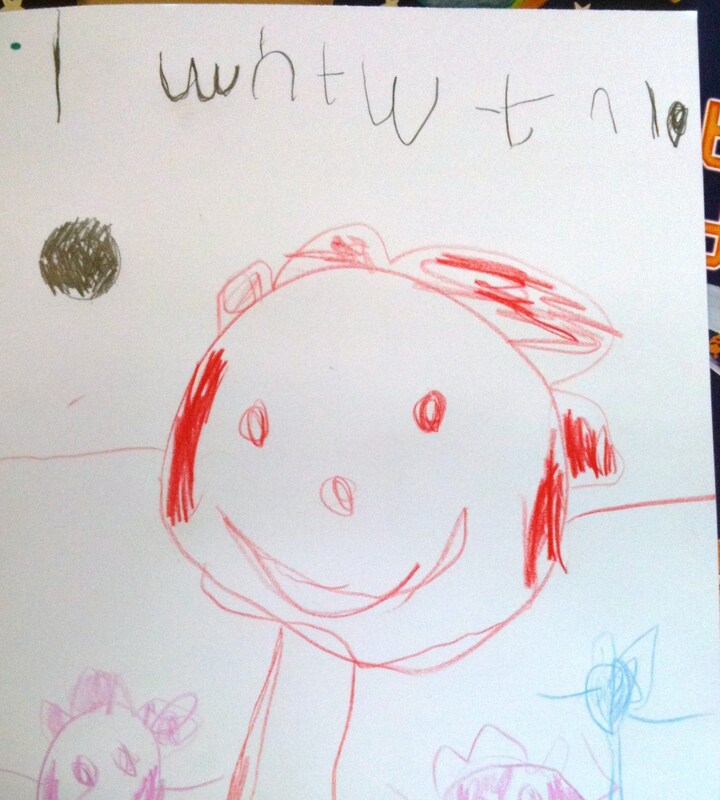 I love how you capture the development of your approach, how different kids respond, and what their writing really “looks” like Nina. We’ve been having a lot of conversation around different strategies that might be used to build a bridge between the world of oral language and print. What a great follow-up this will be. Planning to share! Thanks! Thanks for visiting and leaving a comment. Each year I do things a little differently, and this year is no exception. It’s my forth year teaching a ‘straight’ Prep grade, and my practice is changing and improving all the time. Another delightful group of young learners are sitting in front of me, and teaching me. Thanks for commenting. Blogging opens up my classroom to others, reaffirms what I’m doing, and encourages others to share their work with me. I really enjoy sharing in this space. Once again thanks for the support. Well done to your Preps on their fabulous work! 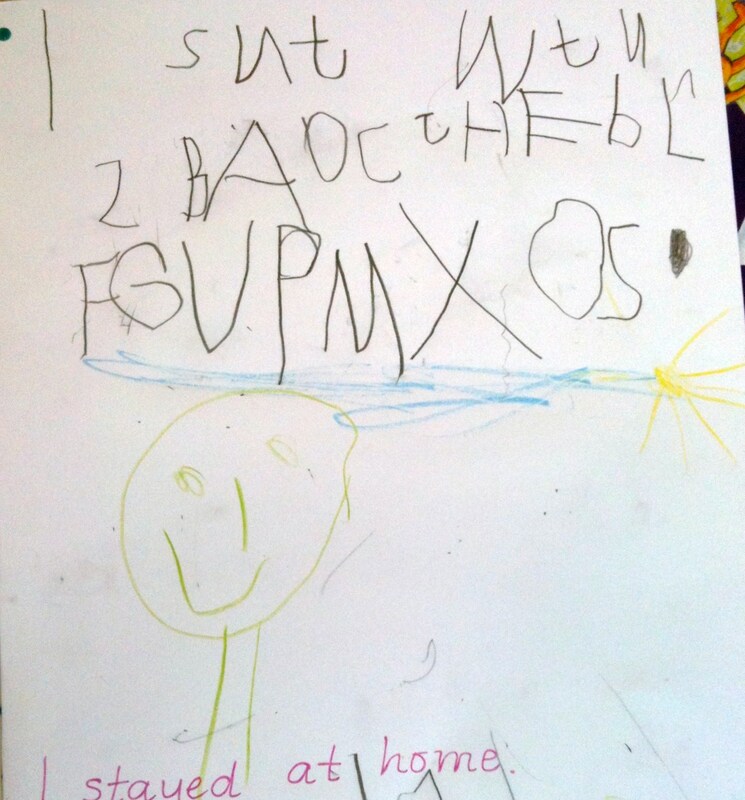 Language experience is such a rich and rewarding form of Literacy and it’s so powerful for Preps to experience reading success in the very early stages of their schooling. Even better for you to be blogging about it so that others can share their success!